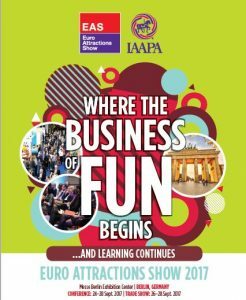 24-28 September 2017, Berlin will be the center of the leisure industry as Euro Attractions Show (EAS) 2017 comes to the capital of Germany. The evet will offer participants the most comprehensive education program to date, including up to 100 speakers representing the key industry fields and the different leisure attractions and entertainment destinations across Europe who will share their expert knowledge. The education program will offer more than 20 seminars which cover such topics as, safety, marketing and communications, revenue generation, evet production, and more. Executives from Europe’s top leisure attractions and entertainment destinations who will take part in the extensive three-day seminar program, include among others Christoph Kiessling (General Manager, Siam Park Tenerife), Robert Dahl (CEO, Karls Tourismus GmbH), Andreas Leicht (General Manager, Hansa Park), Andreas Sievering (General Manager, Fort Fun), Martin Kring (General Manager, Legoland Deutschland), Bruno Vanwelsenaers (Managing Director International, Tomorrowland), Fernando Aldecoa (General Manager Operations and Finance, PortAventura World) and Andreas Knieriem (Zoo Director, Berlin Zoo). In addition, participants can hear speakers from companies outside the traditional leisure and attractions industries, including Bas Bakkers (International Manager Leisure, The Coca-Cola Company), Christoph Zwahlen (Global Marketing Manager, NXP), and Thorsten Düß (Director, Weber Shandwick). Creating / Immersive Experiences Track about the creation of unique experiences. registration information is available at www.IAAPA.org/EAS.